We took a look at Amazon’s latest Kindle Paperwhite e-reader a few months ago, and now it’s time to tackle its best competitor: Kobo’s Glo HD. This e-reader shares numerous features with the Paperwhite, such as screen size, resolution, storage, and pricing. Can Kobo’s Glo HD match or perhaps even best the Paperwhite? 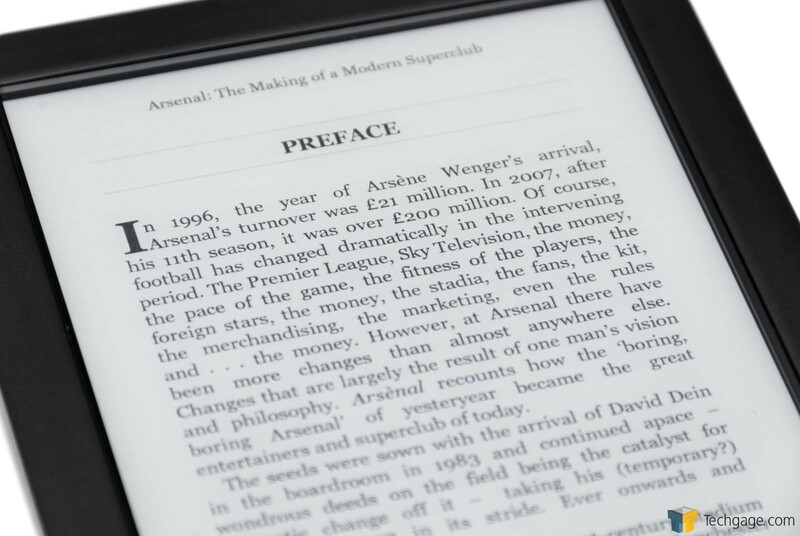 Back in June, I took a look at Amazon’s latest Paperwhite e-reader. At the time, I was oblivious to the fact that Kobo had released a perfect competitor to that e-reader just a month earlier, called Glo HD. It’s now time to take a look at that one, and see how it compares. In this particular matchup, it’s impossible to find a clear winner. The reasons are tied entirely to the fact that Amazon and Kobo offer their own bookstores; books purchased for Kobo can’t work on Kindle, and vice versa. Due to Amazon’s reluctance to offer EPUB support, even DRM-free titles purchased at Kobo will not work on Kindle. This simple fragmentation can cause big headaches for first-time e-reader buyers. Whichever platform, if you want to call it that, a buyer chooses, he is going to feel locked-in. This isn’t a big issue if you don’t mind having split libraries in the event you do shift over down the road, but even so, it’s not ideal. If there’s an upside to any of this complication, it’s that both Amazon and Kobo both offer comprehensive e-reader selections. If a Kindle looks tempting, Kobo is sure to have a similar option. Such is the case with the Glo HD, which matches the third-gen Kindle Paperwhite in form-factor (6-inch), resolution (300ppi), and storage (4GB). Aside from their respective DRM-laden content, both Amazon and Kobo offer a wide range of support for images and other book formats (eg: PDF, MOBI). Thanks to its support of EPUB, I wager that Kobo comes out ahead of Kindle overall. Kobo even offers support for CBZ and CBR comic book formats, which is a neat perk for a monochrome device. Kobo sells its Glo HD for $129.99, which is $10 more than the latest Kindle Paperwhite. Well, kind of. The $119.99 Paperwhite happens to be ad-supported; to get rid of those ads, a $20 premium must be paid. If that’s the version opted for, then the roles get reversed to make the Glo HD ten dollars less expensive. Depending on personal needs, wants, and cares, this pricing can make the Glo HD all-the-more tempting – especially given some of its perks. The Glo HD is 25 grams lighter, for example, and manages to be smaller (157 x 115 x 9.2mm vs. Paperwhite’s 170.2 x 116.8 x 9.1mm) even though both devices use the exact same-sized display. On the software side, the Glo HD also offers much greater control over a book’s text and layout, something I will tackle in a short bit. Also worth noting is that Kobo estimates that the Glo HD can last 2 months on a single charge, whereas Amazon estimates ~6 weeks for its Paperwhite. Battery life will vary dramatically on either device depending on the brightness you use, and whether or not you leave Wi-Fi enabled. Speaking of wireless, unlike Amazon, Kobo doesn’t offer a 3G option for any of its e-readers. For most people, this is likely to be fine, as that $70 premium is a big one just for the sake of being able to download books without an Internet connection. From a physical standpoint, I think the Paperwhite would win a durability test hands-down. The Glo HD weighs less, but it could come at the cost of a less stable design. If I twist the Glo HD ever-so-slightly, I can hear extremely quiet creaking going on – that simply doesn’t happen on the Paperwhite, which feels like a tank in comparison. Another tradeoff is that the Paperwhite’s screen feels a little bit better to the touch; it’s a little grainier versus the Glo HD’s, which has a bit of a glossy feel to it. It’s highly unlikely that the differences would even be noticeable though, since you’ll mostly be tapping the display, not rubbing your finger all over it. Beyond that, the Glo HD has a rubberized back, which is much nicer than the Paperwhite’s Plain Jane plastic back. At quick glance, the displays on both of these devices look exactly the same at full brightness. With careful inspection though, it can be seen that the Glo HD’s is a bit “whiter” than the Paperwhite’s. Again, the differences are minute, and unless you can compare them side-by-side, they won’t be noticed. What’s important is that both devices offer very crisp text, thanks to their 300ppi resolution. Given the device’s modest purpose, there’s not too much to be surprised by on the software side of the Glo HD. After dealing with the initial setup, which was quite simple overall, you’ll be greeted to a simple home page that highlights the current book being read, other recent purchases, and quick access to special areas, like your library and the store. If the device is slow to pick up on a new purchase, you can take advantage of the easily accessible sync button on the bottom left side. Because it might stand out, I’ll highlight the fact that despite being a black and white device, the Glo HD can render color, as some of the above screenshots prove. This is interesting mostly for the fact that the Paperwhite didn’t render color in any of the screenshots I took. So, there’s some geeky trivia for you. 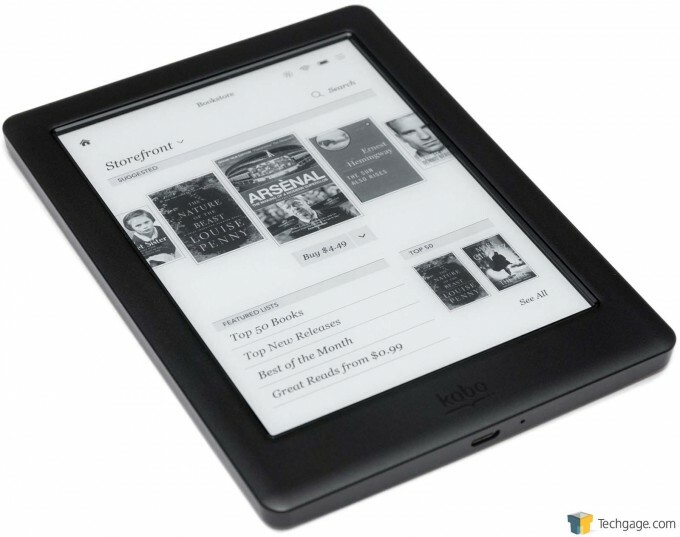 As Amazon does with its Paperwhite, Kobo includes a Web browser on the Glo HD. While the company considers this to be beta software, it proved far more stable than the browser on the Paperwhite. It was also faster and generally did a better job rendering most webpages. For a bit of fun, Kobo has included a number of achievements to acquire. Most of these relate to simply taking advantage of some special features, such as the dictionary, while some might require a Google search to figure out. Believe it or not, in addition to all of the fun stuff I covered above, the Glo HD also happens to be good for reading. That being the case, let’s tackle those capabilities. I mentioned earlier that the Glo HD (and presumably Kobo’s OS in general) offers much greater flexibility with regards to a book’s text and layout, and some great examples of that can be seen in the shots above. While the Paperwhite offers 7 fonts to choose from, Kobo bumps that number to 10. Likewise, Kobo offers 48 font sizes on the Glo HD, which seems kind of incredible given the Paperwhite’s choice of 9. 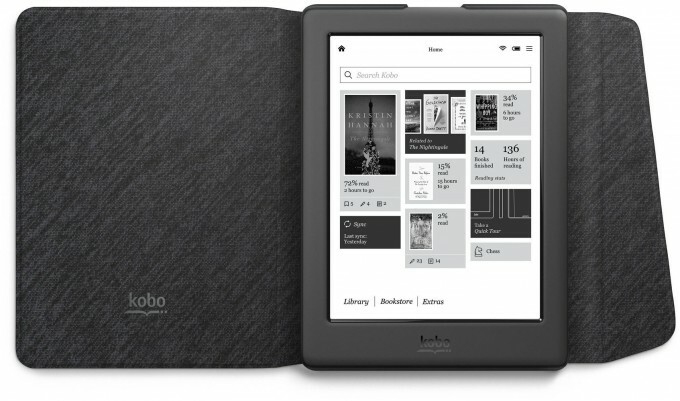 Kobo also bests Amazon with regards to the control of margins and line spacing – users can choose between 10 different settings for each, versus 3 on the Paperwhite. It even adds an option the Paperwhite doesn’t have: justification. I admit that most people are not going to care about this kind of granularity, but I would argue that it’s nice to at least have it. I never once thought that my reading options were limited when I used the Paperwhite, but to me, the freedom Kobo offers is awesome. In the slider above, I’d recommend checking the second image. What you’ll see is even more control over the fonts. There, you’ll be able to adjust the weight along with the size, allowing you to find what you consider to be a perfect look. There’s even a before / after example given to help you to compare. Other features shared between the devices is dictionary support (tapping and holding a word will reveal its definition), in-book searches, and the ability to take notes. The devices do trade some punches. Amazon has a nice tie-in with Wikipedia, and also offers a feature called X-Ray, which allows you to read interesting tidbits about a character you highlight. On the Kobo side, it offers some nice in-depth stats, such as the number of pages you’ve turned, your average session duration, and average number of pages read per minute. Having been impressed enough with Amazon’s Kindle, I admit I wasn’t sure what to expect from Kobo with its Glo HD. But in the end, I am left genuinely impressed. Some might think that an e-reader is just an e-reader, but that’s, ahem, fiction. There are a couple of areas where I think Kobo one-ups Amazon. From an aesthetics standpoint, I think Kobo’s OS looks better. I do believe the home page of the Paperwhite has a less messy layout, but beyond that, Kobo uses nice fonts and styling effects all around its OS. As mentioned above, the reading options are much improved as well with regards to control, though it doesn’t have the Wikipedia tie-in or support for Amazon’s neat X-Ray feature. As with most products, you can’t have it all in just one. Performance-wise, I never encountered an issue with the Glo HD, although it does seem to be a bit slower than the Paperwhite. Contrasting that, I found that the built-in Web browser to be far superior to the one on the Paperwhite. I honestly can’t imagine ever using a Web browser on a device like this, but those who will should appreciate the one that’s more stable. The biggest downside with the Glo HD, to me, is that it doesn’t seem as solid or as well-built as the Paperwhite. That’s not to say it’s poor; it’s just that the Paperwhite gives me a lot more confidence about its durability. On the other side of the coin, the Glo HD one-ups the Paperwhite’s plastic back with a rubber one, and is smaller / lighter, to boot. On the durability front, I’d highly recommend getting an official cover for either one of these. I have one for the Paperwhite and now swear by it, and now that I see a few dings on the Glo HD’s screen, I realize just how useful covers can be. Full-blown tablets tend to resist nicks extremely well, but e-ink screens don’t. One other downside is one that all Kobo e-readers share: each page has a footer and header displayed. That’d be fine if there were an option on the device for removing them, but instead a “patch” will be needed to do that. This doesn’t bother me to the point of needing to go the route of the patch, but given the huge flexibility of the device in general, it’s downright bizarre to me that this particular option is not available. When all said and done, if one of these e-reader’s features don’t win you over, your decision will have to boil down to whether you seem to prefer one bookstore over another. After spending a lot of time on both Amazon’s and Kobo’s stores, I can’t offer a “favorite”. Prices seem to be consistent between them, and both are easy to navigate, on or off the respective devices. It goes without saying, though, that Amazon’s selection can never be beat. Overall, Kobo has created an excellent e-reader with its Glo HD, one that doesn’t just match its most appropriate competitor, but manages to best it in some ways. Competes well against Amazon’s Kindle Paperwhite, and in some cases, bests it. High-resolution display looks sharp; backlight has 100 levels. Offers a ton of flexibility for tweaking a book’s text and alignment. Quick access to fun stats. Beta Web browser is quite stable. Lighter and smaller than the Paperwhite. Seems less durable than the Paperwhite. Performance is decent, but not quite up to par with the Paperwhite. Can’t remove header or footer seen on each page without a patch.